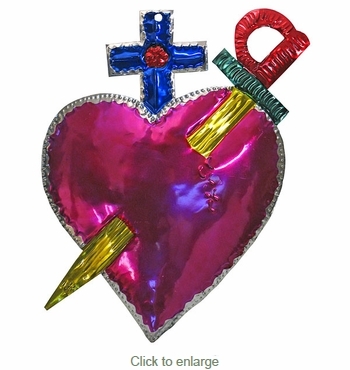 This large painted tin heart ornament with sword and cross was handcrafted by talented folk artists in Mexico. These unique Mexican tin ornaments make a great southwest addition to your holiday decor. The natural tin is hand cut, hand embossed and etched, then painted one piece at a time.